These easy egg recipes are perfect for lunch or dinner. You can add salmon to many of the recipes for an extra dose of omegas and heart-healthy fats. Use food prep to make mealtime even easier! We’re back for another edition of the 4×4 Flexible Food Prep Method. I’m so glad you guys enjoyed the Easy Farro Recipes. 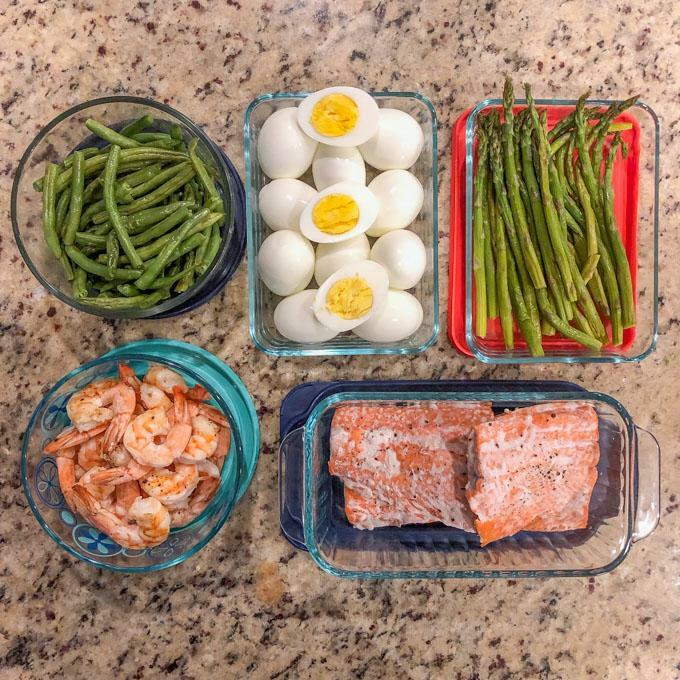 In case you’re new here, I developed this component food prep method and series because I favor prepping ingredients versus full meals on the weekend. I like having prepped ingredients on hand that I can throw together quickly during the week. This is the second post in the series. In each post, I’ll give you four ingredients to prep (at a minimum). You should be able to prep these four ingredients in under an hour so I’ll try to give you suggestions of other things you can prep as well if you have additional time. This week we’re focusing on eggs and salmon. Alright, so what’s on the menu this week? Not crazy about baked salmon? Pan sear it! You could even make some extra to enjoy pan-seared Sunday night. Don’t like salmon or shrimp? Use tuna for the salmon cakes or make some chicken for the quesadillas and/or cobb salad. Have extra salmon? 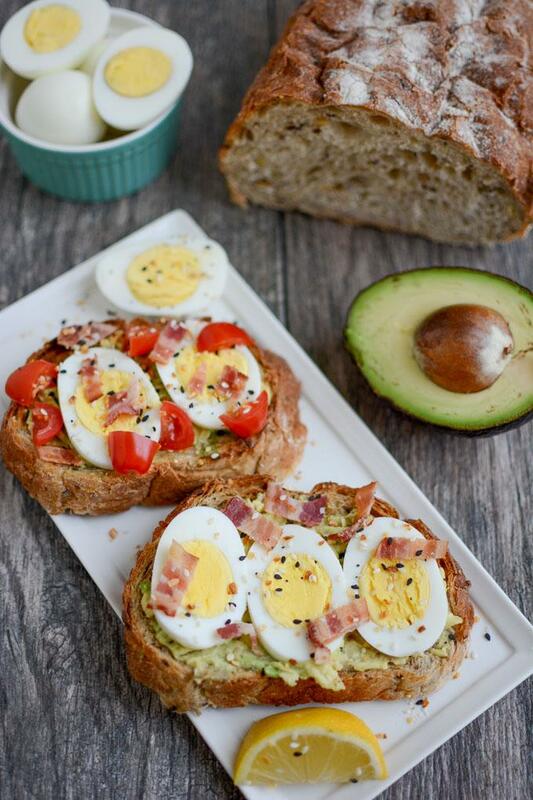 Throw some on your avo toast along with the eggs! 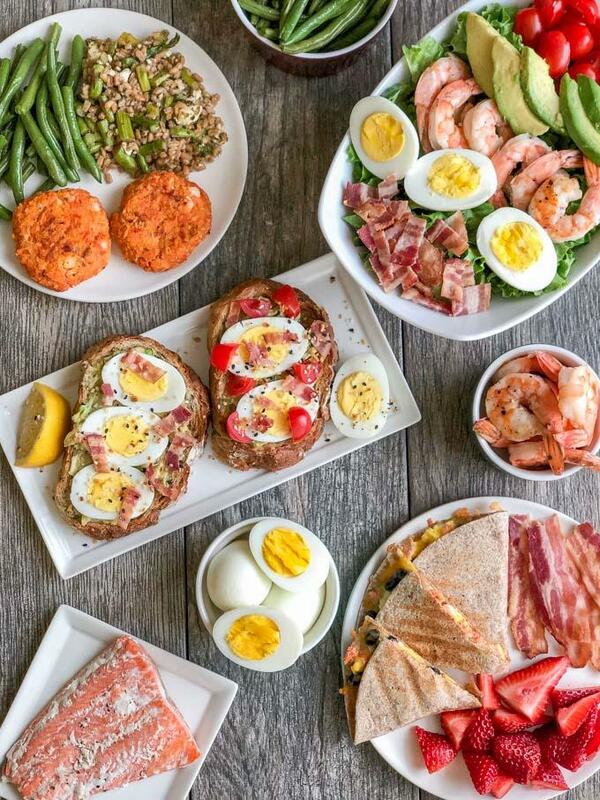 If you don’t like one of these recipes, you could easily make a few minor adjustments and swap one of yours into the meal plan. 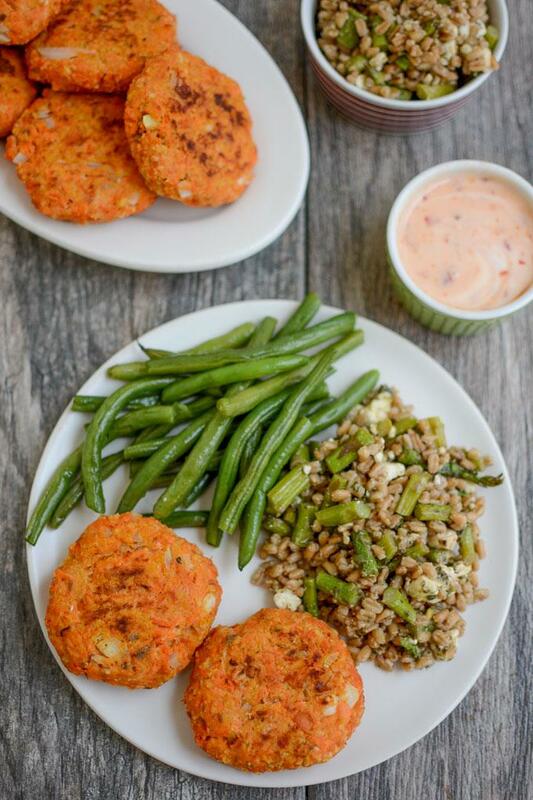 You can actually make the salmon cakes ahead of time and just reheat during the week (or eat cold). Roast some extra veggies or cook a grain to use as side dishes. Prep the lettuce for your salad. This week I ended up prepping my lettuce, baking bacon and roasting green beans and asparagus. Now let’s dive into the recipes. Again, these recipes are quite forgiving. You can use the ideas and sub in different proteins based on your personal preferences and you don’t need exact quantities. And you can easily make a small or large amount depending on how many people you’re prepping for. Enjoy them for lunch or dinner! In a large bowl, flake salmon apart into pieces. Form into 8 cakes, place on a sheet pan lined with parchment paper and bake at 400 for 18 minutes, flipping once. -To make the mashed sweet potato I just poke holes in a sweet potato and microwave for 5 minutes. -For an easy dipping sauce, mix thai chili sauce and sriracha with plain yogurt to taste. -For an easy side dish, I mixed some of the farro and roasted asparagus I prepped on Sunday with some crumbled feta, a little balsamic and a scoop of pesto! – If you don’t like salmon, you could swap two cans of tuna! Divide lettuce between 4 bowls. 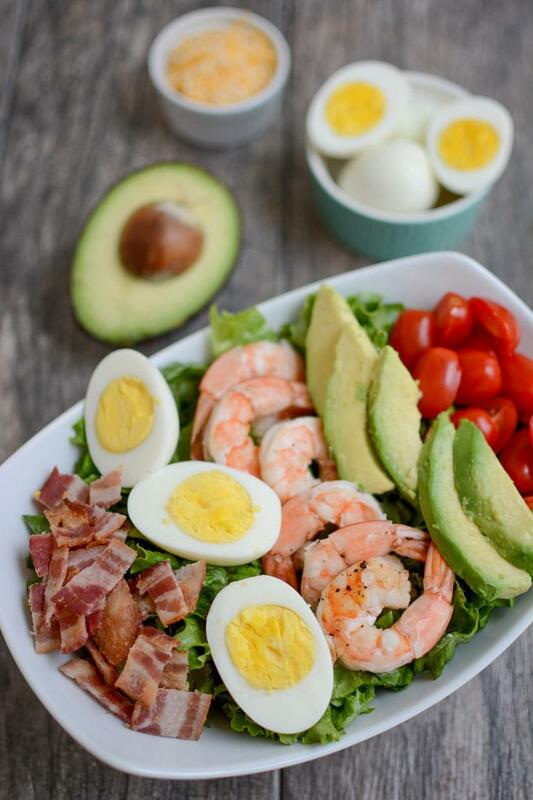 Halve hard boiled eggs and add 1.5 to each bowl, along with 4 ounces of shrimp, avocado, bacon, cheese and tomatoes. – If you’re not a shrimp lover, make some grilled chicken, steak or even extra salmon to use on the salad. – Switch up your greens and use spinach, kale or a spring mix. – Add some nuts/seeds for a little crunch. Slice bread to desired thickness and toast. Spread with mashed avocado. Squeeze lemon juice on top if desired. 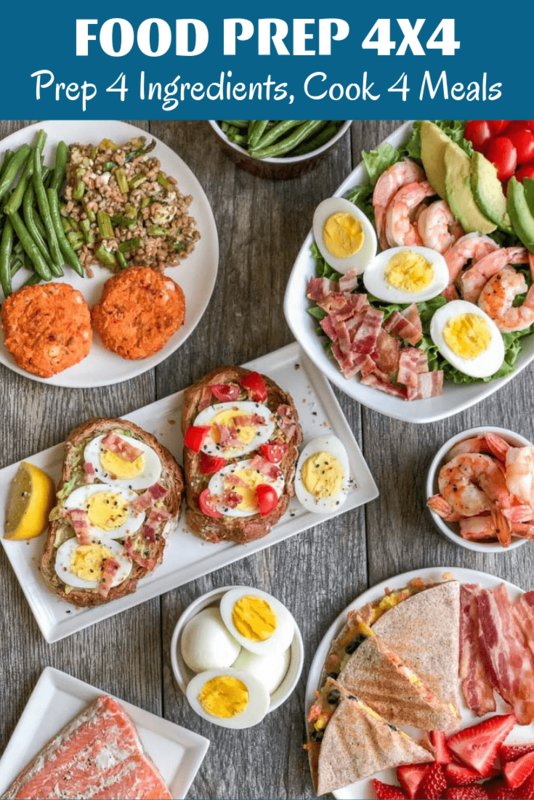 – I like to save this meal until later in the week because it’s super easy, great for lunch or dinner and a good way to use up any leftover salmon/shrimp/chicken you might have along with some hard boiled eggs which keep well all week. – Bake the bacon over the weekend so you don’t have to do it when you’re making these to make them even quicker! -Swap out sweet potato toast if you’re not a bread eater. 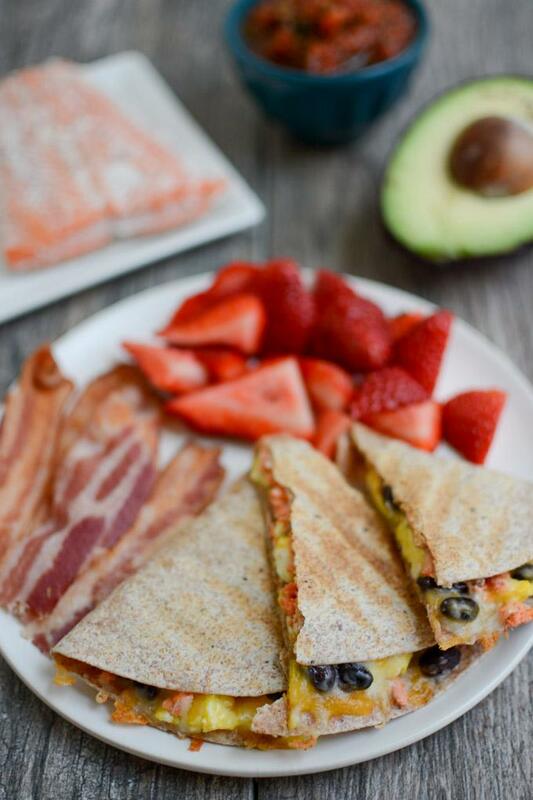 Spread scrambled eggs, flaked salmon, beans and cheese onto half of a tortilla. Fold over and cook in pan, on griddle, on George Foreman, in microwave. Cut into wedges and serve with salsa and avocado. – Make these vegetarian by leaving out the salmon or swap salmon for grilled chicken, chicken sausage or other protein. Here’s a basic grocery list for you. Be sure to double check it and remove items you already have and read the recipes to see if you’re going to make any changes and adjust the grocery list accordingly. optional: chicken or other protein to sub for salmon if desired. Tuna for cakes if desired.